It’s no surprise that, for his 36th studio album, tentatively titled Plectrum Electrum, and his current international tour, Live Out Loud, Prince is bringing three immensely talented young women together to form 3rd Eye Girl, a band tasked with upholding high musical standards, bending to the artist’s musical whim, and having enviable fun along the way. At the heart of 3rd Eye Girl is drummer Hannah Ford. Her versatility, which she says grew dramatically while enrolled at the Chicago College of Performing Arts, is equaled by her genuine feel for the music, honed by years of studying and performing dance. As the fourth of six talented children, Ford says she felt free to find things that brought joy to her life, and experienced tremendous support from her parents. That experience helped her develop “Peace, Love and Drums” while still in high school. The motivational program aims to give others the same courage she had to reach for their dreams. Upon her own graduation from high school, knowing what she wanted to do and where she wanted to pursue it as a career, she considered moving to Los Angeles. Ford says her drum instructor of two years, Paul Wertico, who also happened to be head of the jazz department at the Chicago College of Performing Arts, convinced her to attend school. Ford auditioned there and at Berklee College of Music, and received scholarship offers to both. “I spent two years in college, and learned so much about the history of music. Paul is so smart when it comes to jazz history and music history. He actually taught the jazz history course at CCPA. I learned a lot about the history of jazz, classical music theory, classical piano, jazz music theory and jazz piano. I was in fusion combo, Brazilian combo, swing combo, hard bop combo, Latin ensemble and big band. It opened another world of music for me. In addition to lessons learned in the classroom, Ford says one of the most important was learning to develop a strong network and take a professional approach to building her career. “Networking is the biggest part of this business. I’ve met so many amazing musicians that have a hard time getting their name out there, have a hard time getting that big break that we all hope for. Then I’ve met others, who maybe aren’t necessarily the most talented, that have amazing exposure and they know everybody and they’re playing all these awesome rooms and gigs,” Ford says. As one of the fastest up-and-coming drummers in the country, and one with seemingly limitless potential, Ford could have simply jumped for the best endorsement deal. 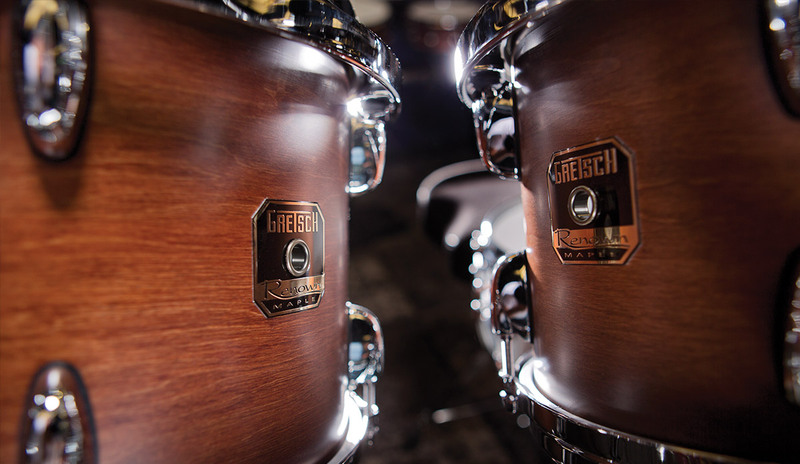 However, her love and enthusiasm for Gretsch drums came from a floor demo she experienced as a kid, not unlike one you might see at your local Guitar Center store. 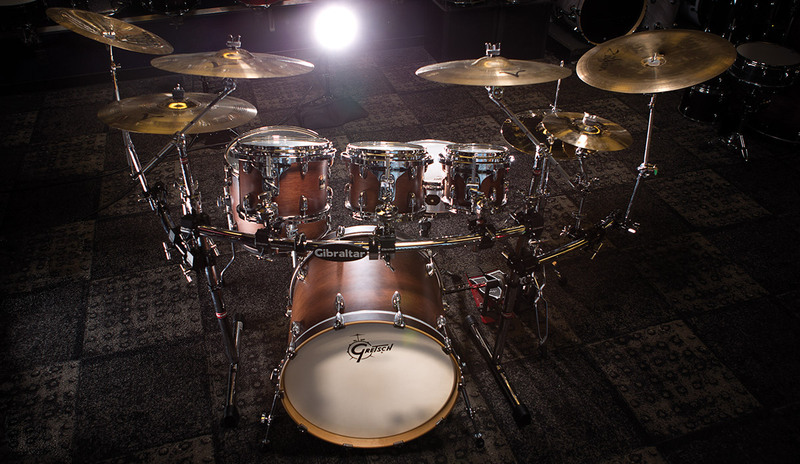 Ford says her Gretsch USA Custom is outfitted with Evans drum heads: Black Chrome heads on the toms, and an HD Dry batter head on the snare. “Evans heads are phenomenal. I usually play the EC2s on my toms, but I’m using the Black Chrome heads on my toms for the Prince tour. It’s the first time I’ve used those and they sound great,” Ford says. Ford says her stick preference shifted dramatically while in college, from 5B sticks to lighter, jazz model sticks. 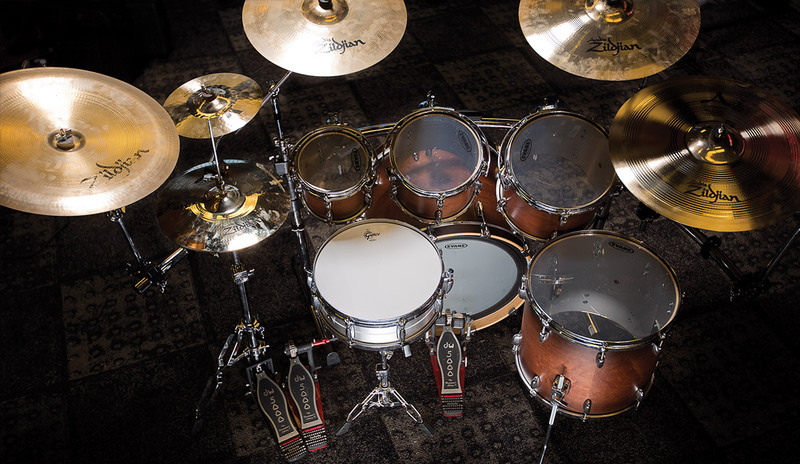 A percussionist as versatile as Ford needs to have a wide-ranging arsenal at her disposal. Ford says Toca percussion offers reliable gear that delivers the authentic sound that the most demanding players are looking for. When Prince and Ford’s other bands are working with loops and samples, she says they’re all run through the Roland SPD-SX. Even while on tour with Prince, Ford is busy planning and writing for a number of side projects, including one with trained multi-instrumentalist and husband, Joshua Welton. Though the project is not ready for public release, Ford says it’s been fun and exciting to work with her husband.